"Rubber ducky, you're the one. You make bath time so much fun! He he he"
Anybody who's grown up in this country since the 1970's is more than likely familiar with that particular song lyric. Sesame Street has been a staple of American culture for nearly fifty years now and has created a long line of iconic, Muppet characters - Big Bird, Elmo, Cookie Monster, and the Odd Couple-esque Bert and Ernie. Speaking of the latter, Ernie and his attachment to his rubber ducky is a better love story than Twilight. 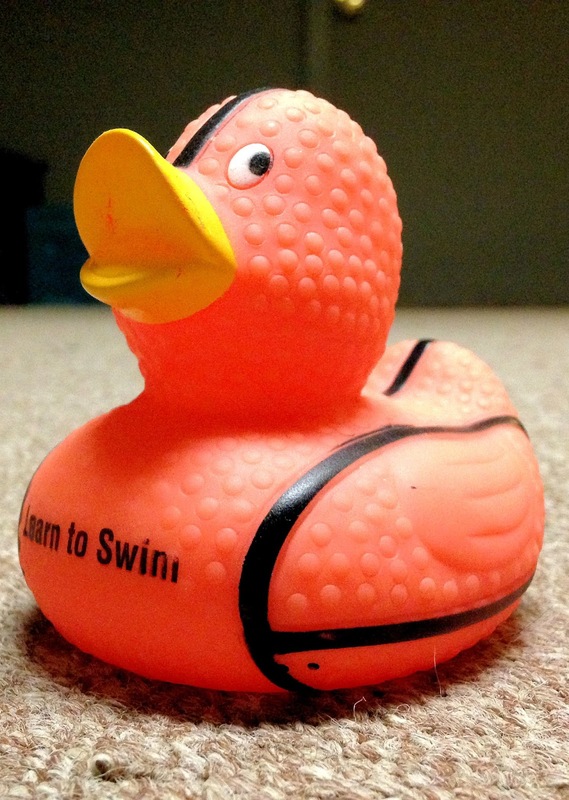 Certainly, that little orange puppet would ecstatically would be celebrating National Rubber Ducky Day today. Yes, this is an actual, declared day of celebration. There truly is a holiday for everything, these days. Anyway, someone else who would be right there partying with Ernie and his birdie buddy is my fiancee. This here is a stock photo (most of our personal possessions are in storage, since we're between permanent homes) but this lady has a synthetic bird for every one of the Chicago sports teams, including the exact one seen above... except Da Bears... she hates the Bears. After all, she was born and raised in Delaware, right on the Pennsylvania border - prime Philadelphia Eagles territory. 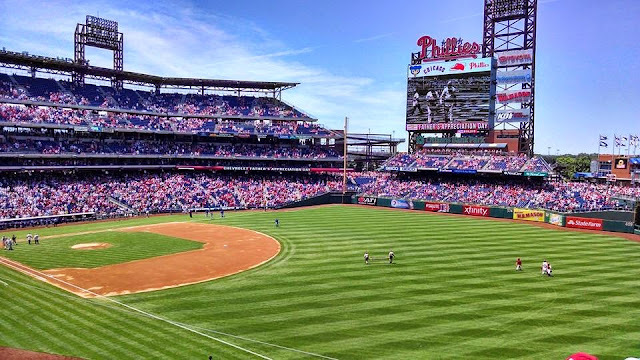 She made sure to pick up a properly-attired duck at Citizens Bank Ballpark to honor her second favorite baseball team (converted White Sox fan, psh) when we visited the East Coast a couple of years back. She decided to name it Ryne, seeing as Mr. Sandberg was managing the Phightin' Phils at the time. At this point, you can tell that the girl has an awful lot of rubber ducks. In the background of the above picture, which dates from our previous living abode, you can see two of the three glass vases that were filled to the brim with synthesized water fowls. 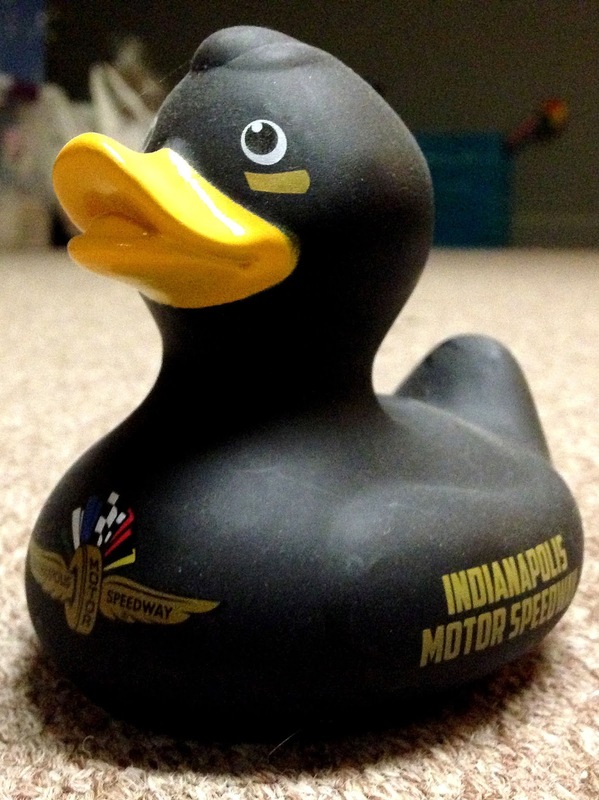 Rubber duck collecting must be a secretly booming industry, seeing as there are licensed, souvenir ducks available at just about every sporting event, including the Indianapolis 500. My fiancee decided to join my siblings and I this past May, for our annual pilgrimage to the "International Sweepstakes" and came away with the perfect souvenir. Just ducky, even. Meanwhile, I know she has an official one somewhere (hockey is actually her favorite sport), but this generic, hockey-playing bird on the right looks suspiciously like a Blackhawk to me... What say you? These ducks might be made out of rubber, but they sure wouldn't make suitable balls for sport, however hard they might try to camouflage themselves as such. 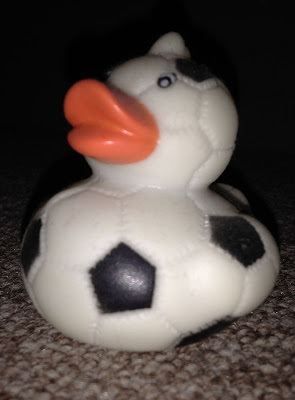 The soccer, or football, if you're international, duck on the left came into her possession as a gift from her future mother-in-law. Where it came from, beyond that, I'll never know. On the right, I won this fowl on Listia as a stocking stuffer, Christmas gift for my favorite duck collector. 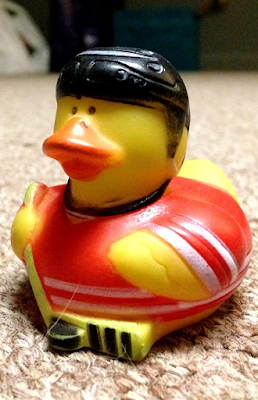 It's kinda bizarre though: the basketball duck looks more like it has goose pimples than hardwood aspirations. Also, for some reason, it says "Learn to Swim"... last time I checked, Madison Square Gardens didn't have a pool, hmmm. 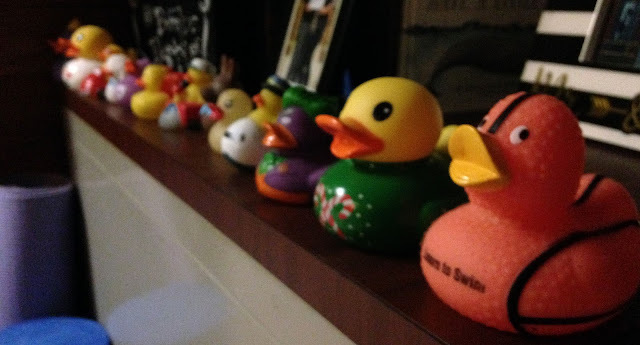 ... but three shelves, chock full of rubber duckies and other assorted birds of a feather. There are train engineers, Audrey Hepburns, Jokers, pilots, pirates, palace guards, and even emos with bills hanging out on our areas of display. 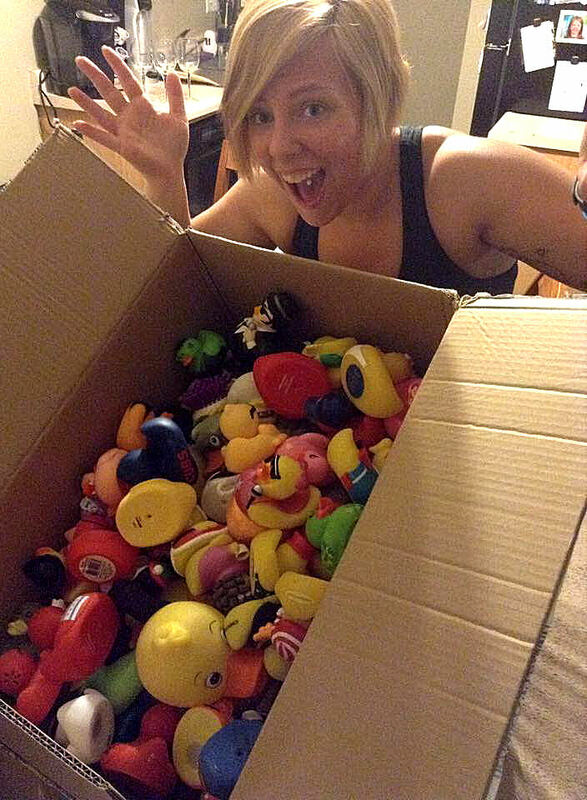 Here's a photo from our moving day... an entire box crammed with nothing but rubber water fowls. An entire box dedicated to nothing but her rubber duck collection. What a quack! I like to give her crap, but I must confess that I am completely complicit and supportive of her obsession. I buy them, I help search them out and, admittedly take a good bit of enjoyment out of each new one added to her stash. I am a natural collector, after all. 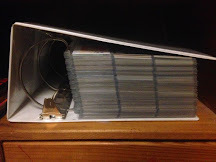 Plus, conversely, she can never judge me too hard when it comes to my trading card addiction. It's a perfect balance. 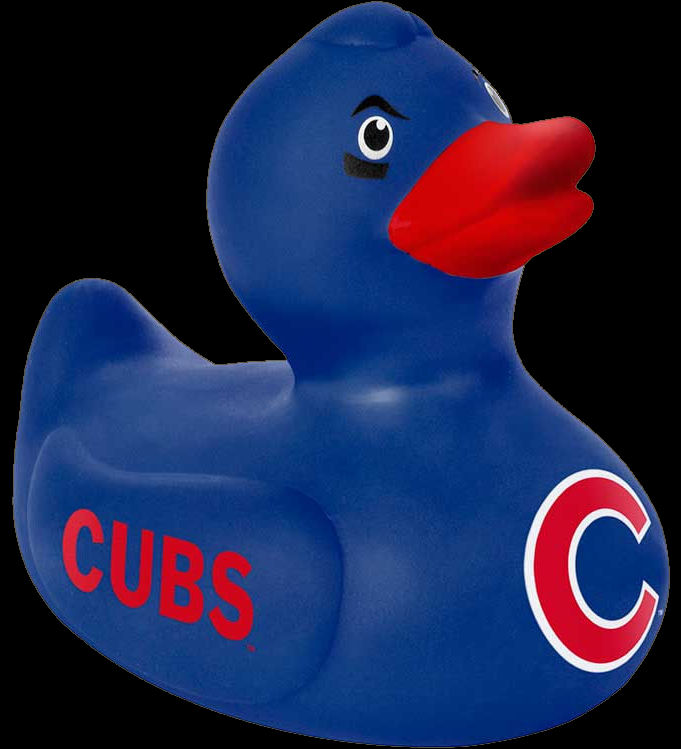 And so I say, to Ernie from Sesame Street, to my lovely fiancee and to everyone who might be reading this blog post - happy National Rubber Ducky Day! Now go out and... draw a bath and celebrate accordingly? "converted White Sox fan, psh"
I know, in many lands, saying this is wrong, but have I mentioned how gorgeous your future wife is? She's a minimum 9 for just being a Sox fan. Though, there will be deductions for liking the Eagles. And not for hating the Bears, but because Philly fans in general a total a-holes. Awesome! 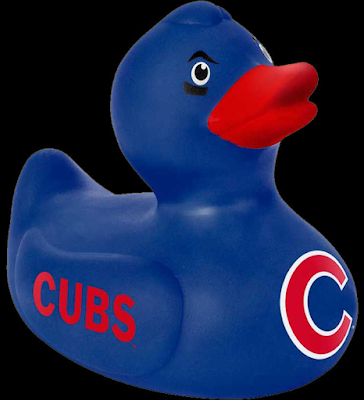 And now, of course, you know that if I run across a nice rubber duck at some point that it may find itself as part of any future package that I send you. I agree, I think the bat duck is my favorite. Kind of reminds me Darkwing Duck. I worked at Lids just before these became popular. We were buying them and I thought they were the dumbest thing ever and were bound to be an epic waste of money. I'm not wrong too much in my industry, but this was one case where I was. Even with the success they've had, I still don't actually see the appeal.